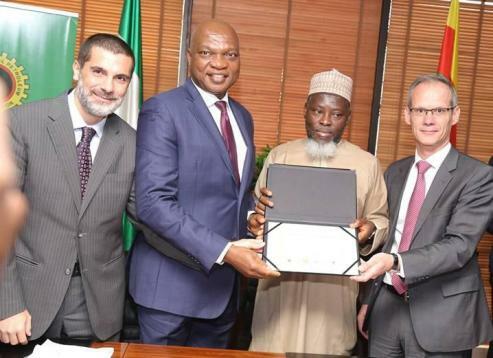 L-R: Managing Director, Nigeria Agip Oil Company, Lorenzo Fiorillo; Managing Director, The Shell Petroleum Development Company of Nigeria Limited and Country Chair, Shell Companies in Nigeria, Osagie Okunbor; Chief Operating Officer Upstream, Nigeria National Petroleum Corporation, Rabiu Bello; and Managing Director, Total Exploration and Production Nigeria, Nicholas Terraz, after signing the Final Investment Decision Charter for the 300 million Standard Cubic Feet of Gas Per Day Assa North Gas Development Project, in Abuja… on Wednesday. LAGOS FEBRUARY 14TH (NEWSRANGERS)-The Shell Petroleum Development Company of Nigeria Limited (SPDC) and its joint venture partners signed a Final Investment Decision agreement for a 300 million cubic feet of gas on Wednesday in Abuja at a ceremony witnessed by the Managing Director of Total Exploration and Production Nigeria Limited, Mr. Nicholas Terraz and the Managing Director of Nigeria Agip Oil Company Limited, Mr. Lorenzo Fiorillo. SPDC had announced taking FID last December on the Assa North Gas Development Project which is one of the Seven Critical Gas Development Projects of the Federal Government. The project, located in south-eastern Imo State, aims to position Nigeria as a regional hub for gas-based industries while complementing Federal Government’s aspiration for gas sufficiency for domestic consumption, power generation, and gas-based ammonia and urea fertilizers for farmers. At peak production, the project is expected to produce 300 million standard cubic feet of gas per day and will be treated at SPDC JV’s Gas Processing Facility and distributed through the Obiafu-Obrikom-Oben pipeline network. Speaking at the FID agreement-signing ceremony, Group Managing Director of the Nigeria National Petroleum Corporation (NNPC), Dr. Maikanti Baru, described the project a major investment towards fulfilling the domestic gas aspiration of the Federal Government, adding that the corporation was excited at the progress with the project and would provide the needed support to ensure first gas production as soon as possible. Baru, who was represented by NNPC Chief Operating Officer Upstream, Mallam Rabiu Bello, said, “The NNPC Project Management Board would work hard to ensure progress having provided the necessary approvals and enablers,” adding on successful completion, the project would translate into huge social-economic benefit to Nigerians. Also speaking, Managing Director of SPDC and Country Chair, Shell Companies in Nigeria, Mr. Osagie Okunbor, described the progress with the FID as good news for the SPDC JV and Nigeria for the accelerated growth of the domestic market and optimisation of SPDC’s onshore footprints. Okunbor said, “The project is key to driving the Federal Government of Nigeria’s ambition of marching away from a mono-economy through diverse industrial growth. It is premier amongst the Seven Critical Gas Projects initiative led by the Ministry of Petroleum and the Nigerian National Petroleum Corporation (NNPC). Their integrated focus, support and drive were instrumental to this investment decision. SPDC had earlier signed a Global Memorandum of Understanding with the clusters of host communities of the Assa North project for community development projects in addition to some other community initiatives already executed by the company ahead of construction work. SPDC is the operator of a Joint Venture involving NNPC, which holds 55%; Shell 30%; Total Exploration and Production Nigeria Limited (TEPNG)10%; and Nigeria Agip Oil Company Limited (NAOC) 5%.